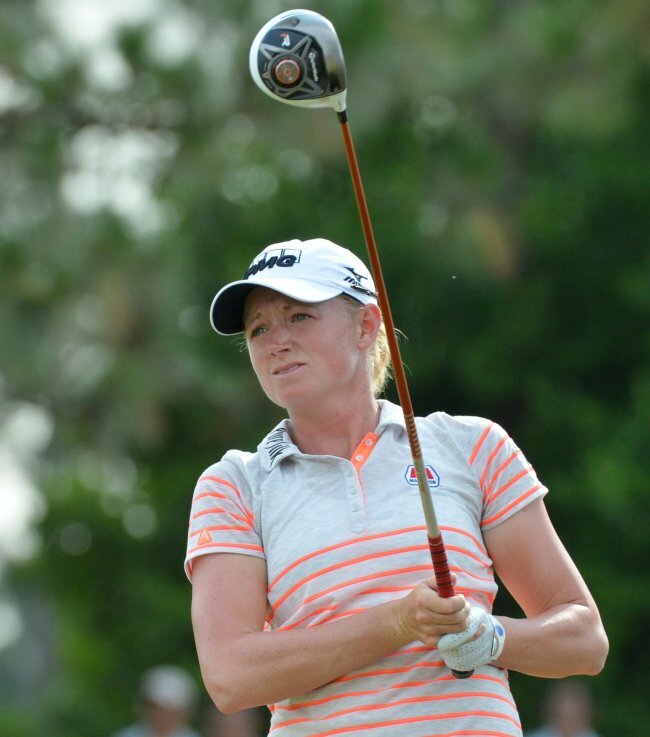 NAPLES, Florida (AP) ― Stacy Lewis was three shots out of the lead Thursday and one step closer to the largest payoff in women’s golf at the CME Group Tour Championship. Lewis overcame the kind of tension she typically feels on the weekend at majors. She held it together with her short game, made a 25-foot eagle putt late in her opening round and wound up with a 3-under 69 to trail Julieta Granada by three shots. “It’s going to be a long week if we’re feeling that on Thursday,” Lewis said. Granada played bogey-free in a tough wind on the Tiburon Course for a 66 that gave her a two-shot lead over Sandra Gal in the LPGA Tour’s final tournament. The other event is the Race to CME Globe, which pays a $1 million bonus to the winner. Only the top nine players in the standings can win it, and Granada isn’t one of them. She still hopes to close out the season with her first victory in eight years. The top three players ― Lewis, Park In-bee and 17-year-old Lydia Ko ― need only to win the tournament for the $1 million bonus. Lewis is atop the standings, so finishing ahead of the other two is a good spot to be. Park and Ko each shot 71. “I think everybody is thinking about the $1 million,” Park said. It certainly showed at the start, especially when Lewis sent her opening tee shot well to the right. She recovered well and nearly holed a bunker shot for birdie. Conditions were tough enough that only five players broke 70, and 19 of the 69 in the field broke par. Lewis surged ahead with a hybrid from 217 yards that finished pin-high at the back of the green on the par-5 17th, and she lightly pumped her fist when it fell for eagle. All week long, the chatter has been about everything at stake at the Tour Championship. Along with the $1 million bonus, Lewis or Park could take home all the significant awards on the LPGA Tour ― player of the year, Vare Trophy for lowest scoring average and the money title. Granada knows what it’s like to be an instant millionaire. She was a 20-year-old rookie in 2006 when she captured the ADT Championship, which at the time was turned into a winner-take-all extravaganza. That remains her only LPGA victory. DUBAI (AP) ― Top-ranked Rory McIlroy returned from a six-week absence to shoot a 6-under 66 for a share of the lead on the first day of the season-ending DP World Tour Championship on Thursday. McIlroy birdied four of his opening five holes and then two of the last four to join Irishman Shane Lowry at the top of the leaderboard at the Earth Course at Jumeriah Estates Resort. McIlroy has been in Dubai for the better part of two weeks after electing not to contest any of the opening three events on the Tour’s Final Four Series. He played in the Grand Slam of Golf in Bermuda but his Dubai round is a first competitive effort on tour since shooting a final round 68 for a share of second place last month in the Alfred Dunhill Links Championship. Lowry arrived in Dubai fresh off the disappointment of finishing in 25th place in last week’s Turkish Airlines Open. Ranked No. 52, the Dubliner is hoping to finish inside the top 50 and with an exemption to enter all four majors in 2015. MELBOURNE (AP) ― Defending champion Adam Scott stayed in contention at the Australian Masters on Friday with a 4-under 68 to leave him six shots off the lead after two rounds at Metropolitan Golf Club. Leader Michael Wright shot a 68 Friday for a 36-hole total of 9-under 135, two strokes ahead of fellow Australian Paul Spargo on a crowded leaderboard. Scott, who was tied for 12th, has won the last two Australian Masters, also at Melbourne sand-belt courses ― Royal Melbourne last year and Kingston Heath in 2012. His playing partner, 2006 U.S. Open champion Geoff Ogilvy, was five strokes behind after a 71. All three Americans made the cut ― Kyle Stanley was 2 under after a 73, Boo Weekly (72) was even and Zac Blair (75) was 1 over.